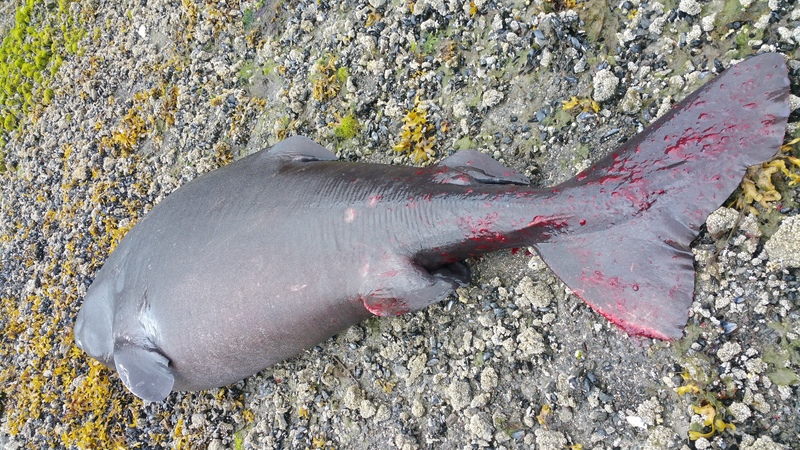 Pacific Sleeper Shark Discovered On A Majestic View Adventure Near Homer, Alaska! Every so often I blog about one of our animal, bird, or fish species that we find in the Homer area. Today’s is a very unique one indeed! 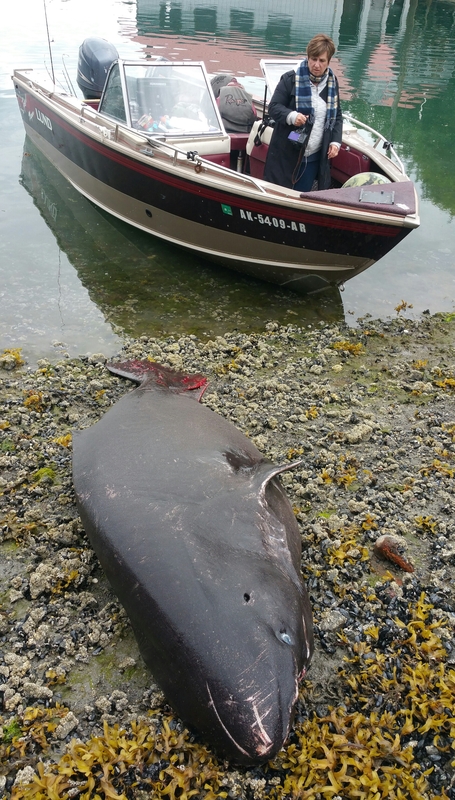 While on a 6-hour tour with Pat and Rita Powers, who were guests at Majestic View Bed and Breakfast, we came across a large fish washed up on a beach inside Halibut Cove. At a distance, I knew that it was out of place. The color resembled that of a very large halibut, brown side up. My wheels started spinning as to what, why, how, etc. as I drove over for a closer look. As I got nearer, I knew that it was far too large to be a halibut, and the shape of the fish was also not that of a halibut. I quickly beached the boat, exclaiming to my guests “It’s a shark!” as I flew through the air. 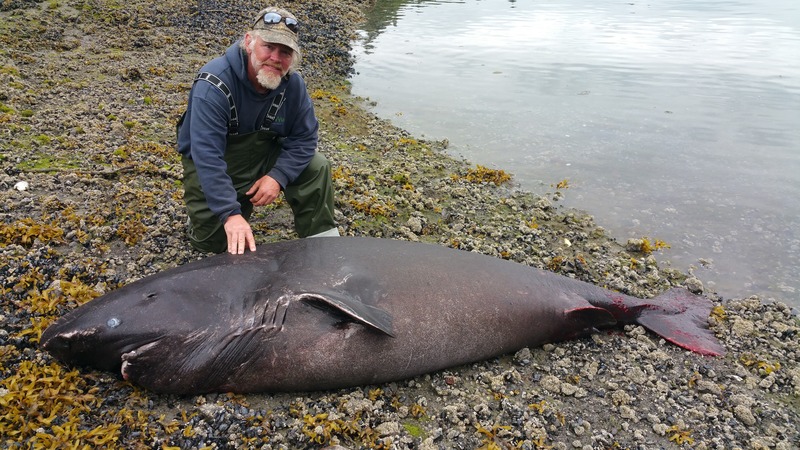 At first, I assumed that it was a Salmon Shark, since I have a profound interest in them (I want to catch one) and they are known to be found in Kachemak Bay – pursuing the pink, red, chum, and silver salmon that are in the bay right now. But examination of the teeth left me thinking that it was some kind of other shark. The teeth were short and saw-like – unlike the teeth of a Salmon Shark, which are more like what you see on a Great White Shark (they are related). I snapped a few pictures and left to continue our tour, with every intention of doing some research, and returning to take a closer look at the shark, after work. Well, work morphed into a very long 16-hour day on the water. I did three back-to-back fishing/wildlife/scenery tours, and a water taxi job. By the end of that, I was exhausted, and wanted my bed. Further examination of the shark would have to wait until tomorrow, and if the tide took it away, then so be it. 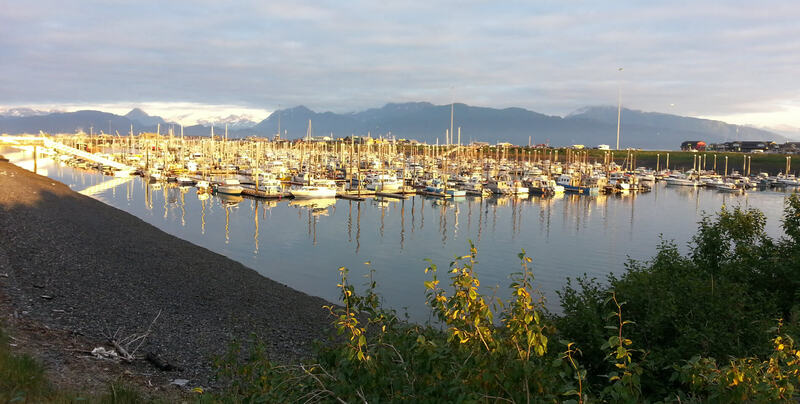 Yesterday, I went back to Halibut Cove after work, and found that indeed, the shark was gone. I’m not surprised either, because two tide cycles had occurred since I was last there. I stopped by the dock at The Saltry Restaurant, and talked to the owner and some of the staff. Apparently, they had seen me examining the shark from their deck, and went over to investigate after I left. Boys being boys, they decided to open up the gut to see what was inside (that’s what I would have done), and found pieces of Octopus, Halibut, Salmon, and “some feathers from some birds.” The owner of the restaurant told me that historically, a shark will wash up inside Halibut Cove “about every five years”, and one of the cook staff told me that he had “seen a shark struggling in the water” the day before, the morning that I found it dead on the beach. The shark must have been it in the last few hours of it’s life at that time. At low tide, I cruised the shoreline of both lobes of Halibut Cove – looking for the remains of the shark, and, I cruised the outside coastline for a couple of miles east and west, looking for a blob on the beach, and groups of sea birds that might be feeding on it, but all to no avail. My guess is that with the high tide, and with the guts being opened up, the current took the shark away and it sunk to the bottom. My research of the top ten entries on a google search revealed these noteworthy scientific theories about the shark. I hesitate to say “facts”, because it seems there is little known about the shark, and theories are somewhat controversial.The name “Sleeper Shark” comes from it’s tendency to glide with little movement, displaying overall low activity with violent bursts of speed only when pursuing prey. Some sites say that it is a predator that catches it’s prey live, while others say it is a scavenger which preys on dead fish on the seafloor, or out of the nets of commercial fishermen. I tend to agree with both theories, and would guess the sharks are opportunistic. Sleeper Sharks have been known to live in depths up to 6600 feet, and were thought to dwell primarily in deep water at first – but other studies reveal that sleepers use the entire water column and would tend to come to the surface or into the shallows under cover of night. Studies have been done to show the contents of sleeper shark stomachs, and they have been found to include just about everything – commonly giant octopus, squid, crab, halibut, salmon, rockfish and most all north pacific fish species for that matter, occasional marine mammals like seals and whales, and even parts of polar bears (supporting the theory that they do come to the surface). The average adult is about 12 feet long and weighs about 800 pounds. I guessed that the one we discovered was more like 9 feet long and 500 pounds. The largest Sleeper Shark that I could find on record was 23 feet long, found in Tokyo. The teeth and mouth of the sleeper, which I took a close-up picture of, are made for sucking in of prey, cutting and sawing it into swallowing- sized chunks with a head-twisting motion. 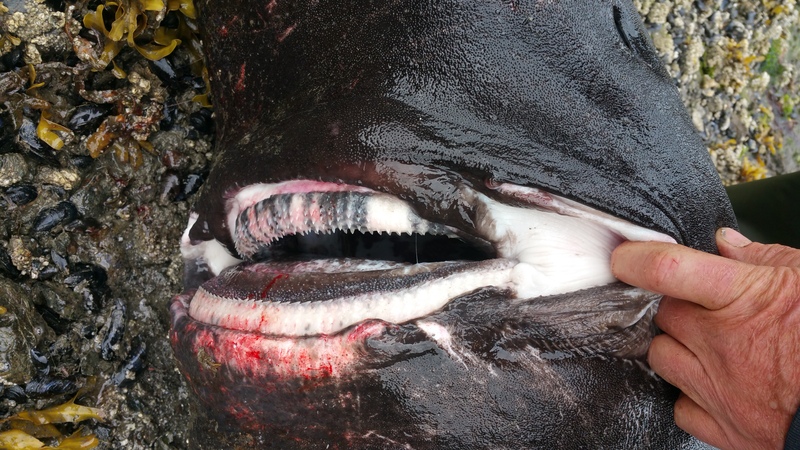 This suggests that there may be seals, fish, whales, and even bears out there, still living, who have had a chunk taken out of them by a sleeper shark. Not many sharks can withstand the cold temperatures of the North Pacific, but the Sleeper Shark is one who can because it’s liver has adapted to maintain fluidity at low water temps; it has also adapted to store urea (which would be a problem for sharks in the southern hemisphere), as well as storage of it’s stomach contents for periods of time when prey is more scarce in the depths. It’s only known predator would be the Orca, and incidentally, I saw a pod of about 30 Orca’s moving through our bay last weekend (sleeper sharks, beware)! It just goes to show – you never know what you are going to experience on a Majestic View Adventure with me, Captain Tim. As my good friend Paul Dorweiler always used to say – “you gotta be out there amongst them.” Enjoy the pictures, and remember, this could be you at Majestic View!